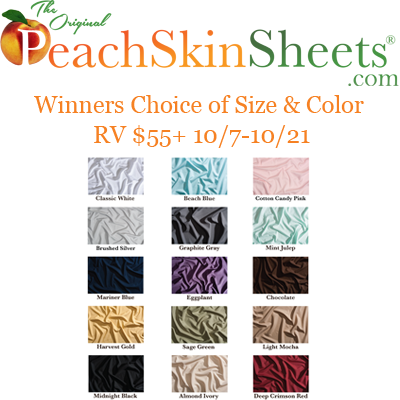 Love, Mrs. Mommy: Winner's Choice of PeachSkinSheets Giveaway! Winner's Choice of PeachSkinSheets Giveaway! These sheets look amazing and would be such a great win! Best of luck everyone! This is my favorite giveaway you girls do. During the last giveaway I ordered every color swatch..it's a toss up..many great colors. I love good quality linens..and, now need them..thanks to Irma I have to replace everything..mold and mildew. I have gotten the swatches before and I think that I would go with the eggplant myself. Maybe another one so many options. Love it. Yes, red velvet among others but red velvet is my favorite. i would love to have the pink,so girlly. I ordered Harvest Gold earlier, thanks! I ordered one in beach blue. I didn't order 1 yet but I would pick graphite gray.